This issue featuring a look at the original and revised versions of The Tower Treasure, a review of The Hardy Boys' Guide To Life as well as new collectible discoveries, letters and more! This issue marks the fifth anniversary of The Bayport Times. I'd like to thank the contributers and the readers for making The Bayport Times a success. Note that there was a Supermystery with this title. 74: Tic-Tac-Terror - 1988 Beet red spine - Boys slide down ramp. 75: Trapped At Sea - 1990 Yellow spine - 3 boys in a small boat. 78: Cave-in - 1987 Pink/light pink spine - Boys walk thru fallen timbers. 79: Sky Sabotage - 1990 Red spine - Boys in spaceship light beam. 85: The Skyfire Puzzle - 1989 Red spine - Frank walks in space. 88: Tricky Business - 1988 Orange spine - Boys run from delivery truck. Now you can order Hardy Boys (and other) books from Amazon.com's Canadian division. No more high postage, pay in Canadian dollars too! Amazon Canada has some books that aren't even available in the good old USA! Just about everyone appreciates getting a book as a gift. Check out the New On The Shelves section for the latest Hardy Boys stories or visit my Amazon Sales Page for a huge selection of Hardy Boys, Nancy Drew, Tom Swift, Chip Hilton, Judy Bolton, Horatio Alger, Harry Potter, Bowery Boys, 3 Stooges and other books, CD-ROMs, videos and DVDs - all discount priced. 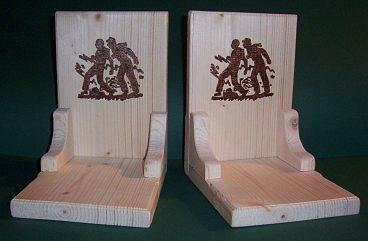 The Bayport Times always needs new Hardy Boys related articles, humor, book reviews or collectible discoveries. If you would like to become immortalized on the web, please E-Mail me at fwdixon@yahoo.com. Tie in to the 70's series. Issued as a promotion by a TV station. Seen on eBay. 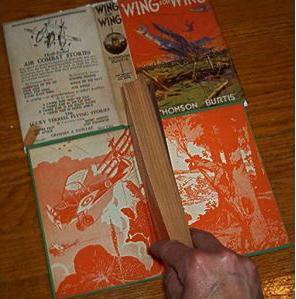 Bound in rear of Wing For Wing by Thomson Burtis. All These Titles Are Available For Sale From Amazon.com - Just Click! Two audio cassette sets in an illustrated cases. A NEW HARDY BOYS E-BOOK !!! Hardy Boys, Nancy Drew, Tom Swift & More! As I begin this review of "The Tower Treasure," the very first thought that jumps to my mind is "well now, isn't it about time!" 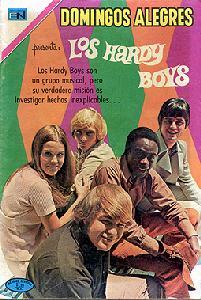 For this was the very first Hardy Boys book I had read, back in the early sixties. True, the version was the revised text (RT for now on) version and not the original text (OT) I now prefer, but it was my FIRST! My original intent was to review just the OT but upon finishing that version, I was compelled to immediately read the RT, with the idea of a second review, offering a comparison with the first (as I had done previously with "The House on the Cliff." ) But then I realized that had two complete sets of notes in front of me and why not review and compare at the same time? This is different from any other review I have written but I decided to give it a go. Hopefully I will find that right balance as I go along. Lastly, as I had recently completed an essay based on the geography of the Northeast in the Ken Holt Series, I'm still in that mindset and therefore have paid meticulous attention to details involving the location of Bayport and to places within and around it. Due to the rather large amount of such information, I've decided to relate these facts, along with my thoughts on them, separately. As with my Ken Holt project, I am including a map of Bayport and environs. Two actually. One based on textual evidence from each format of Tower Treasure." I do plan on adding to this map as I read other Hardy Boys books, that could be a lifetime's work! I have chosen my A.O. Scott and Rudy Nappi illustrated versions of this Leslie McFarlane written story to review and will comment on the art later, including that of Walter S. Rogers. Based on an Edward Stratemeyer outline in 1927, McFarlane has written a 214 page mystery that while relatively simple in plot, nevertheless captures the essence and atmosphere of what the Hardy Boys would become to many future generations. Frank and Joe Hardy are described as sixteen and fifteen years of age, with the elder brother being tall and dark with straight black hair and brown eyes. Joe is pink-cheeked, with fair, curly hair and blue eyes. In the RT, the description of Frank is a bit less detailed, being tall and dark, while Joe is blond and blue-eyed. As the opening chapter begins in the OT version, the Hardy's are motorcycling toward a nearby village on an errand for their father, Fenton Hardy. Here we are told (in both versions) that he has retired from the New York City police force and now handled his own practice. Fenton's age of forty is only given in the OT. Before any action occurs, the boys are talking about a forgery case that they had recently helped Mr. Hardy on. The RT merely mentions that they had aided on a case. But the bottom line is that "The Tower Treasure" is not their first case and not even their first solo case. Fenton surely played the major role in the afore mentioned forgery case and I can reveal (at the risk of jumping ahead), that his role in this case is not insignificant. But that animated conversation between the two would-be sleuths is cut short when a redheaded maniac driver almost runs them down, on the narrow shore road. In the RT, the opening sentence begins with this almost tragic confrontation, between roadster and cycle. It takes seven pages for the OT to reach this point. Quick reactions save them and they are able to finish there case related errand, before deciding to visit their best friend, Chet Morton. Just outside the Morton farm, Frank and Joe discover the wreck of the automobile that narrowly missed running them down. The redheaded driver is nowhere to be seen. The deduction that the crashed car was the same as driven by the speed demon, is immediately made in the RT but arrived at in the OT only after an extensive conversation between the three youths. Still, once deduced, they scramble to give chase as the driver had then stolen Chet's roadster (brilliant yellow in the OT and yellow as well in the RT but also named "The Queen"). Chet is described uniformly as plump and freckle-faced. As Joe, Chet and Frank start their pursuit, an incident occurs that I surely thought would be revised in the RT but was not. The youths happen upon a group of local farmers by the roadside and they stop to question whether they had seen the yellow jalopy come by, recently. In both versions, these farmers are made to sound like country hicks. Overly much so, especially for farmers on the outskirts of a mid-sized northeastern coast city (Bayport of course). The revision by Harriet A. Adams (more of a word reduction, really), would have been an opportune time to correct this totally incorrect perception of semi-rural farmers. After all, did the Morton's act and talk like these hicks, who had nothing better to do than argue amongst themselves and avoid real work? Callie Shaw is met nearby and described as brown haired and vivacious in the OT and brown-haired and pretty in the RT. She is greatly admired by Frank in the OT and liked better and dated by him in the RT. She was on her way to bring cakes and jelly (OT) or a baked cake (RT) to Mrs. Will's home when most of her baking efforts were ruined by the speed demon in Chet's car. Finally realizing that there chase was futile, the trio headed for the Bayport Police Station, to alert Chief Ezra Collig to the theft. This individual is portrayed in two very different lights, between formats. He is a buffoon in the OT and pretty competent in the RT. Also, he was not afraid to seek assistance from Fenton Hardy (and later, his sons), if that was what it took to solve a case. Police Officer Con Riley is present only in the OT, while Police Detective Smuff is changed to a private eye in the RT. In both editions his personality and abilities undergo little change. He is stupid, jealous and vain. After reporting the theft, the Hardy Boys head for their home (said to be on High and Elm Streets in the RT but not specified in the OT), to confer with their dad. Both versions have part of the barn being converted to a gymnasium (and not yet a crime lab). That possibility is raised on the very last page. Fenton is in his library reading when his sons rush in. He is described as "not the type of father who maintains an air of aloofness from his family, the result being that he was on good terms with the boys as though he were an elder brother." I disagree with this assessment, having always considered him an authoritarian figure streaked with kindness and the occasional twinkle in his eyes. While conferring, Fenton explains about the importance of the power of observation, using a Mr. Norton as an example. I mention this because I was pleased at the reference to the Elks as evidenced by Norton's lodge emblem. As a member of that fraternal order myself, this was a pleasure to read about. Laura Hardy is described on page 19 as a petite pretty woman (RT) and makes sandwiches for them on page 45 (OT), but not until pages 141 & 186 of the OT does a description take place. Here she is "of a gentle nature that instinctively shrank from any discussion of crime" plus "fair-haired and gentle." Overall, not much is said about the mother of the Hardy Boys and that is a shame as both parents share in the development of their children and that truth should hold here as well. I was particularly impressed by the prank that Chet plays on Lem Billers and Constable Con Riley (pages 39-44). I actually chuckled at Morton's audacity and frowned a bit that Frank and Joe were also taking such delight in another person's misfortune. This entire scene is omitted in the RT. But in turn, the RT mentions the Hardy family attending church (page 24) while the OT does not. Those sandwiches were for an outing with half a dozen of their chums (page 45 of OT) but not until a later gathering (page 130) are they identified as: Chet, Allen (Biff) Hooper, Jerry Gilroy, Phil Cohen and Tony Prito (a very much off the boat, Tony Prito). They are said to be the same "gang" as went out on the previous outing so really, the count should have been five and not half a dozen. In the RT, these same friends are introduced by name as early as pages 41 & 42 (Tony is second generation here). 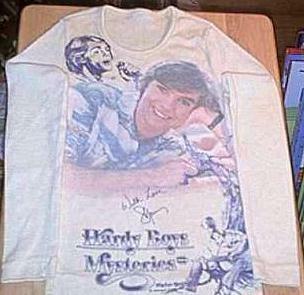 In the RT version, Chet receives a telephoned threat, at his farmhouse, while the Hardy Boys, Callie and his sister Iola were present. The girls were convincingly frightened by Chet's report of the threat and both clutched their throats to indicate this. Iola is describes as "dark-haired and pretty, whom Joe thought was quite the nicest girl at Bayport High and dated her regularly." Oddly, I can find no mention of Iola Morton in the OT until page 174 where she is described as "a plump, dark girl, achieving the honor of being about the only girl Joe Hardy had ever conceded to be anything but an unmitigated nuisance." But in the RT, both of Chet's parents receive fairly detailed descriptions. Mr. Morton is a "good-looking, jolly man with his son's general build and coloring. He was in the real-estate business and ran the farm as a hobby" (page 34). This does help explain why the Morton's are not hicks like other nearby farmers. Chet's mother is "an older edition of her daughter Iola and just as witty and lighthearted." The actual mystery that is associated with the title begins on page 56 of the OT where we learn the Tower Mansion of Hurd and Adelia Applegate had been robbed of $40,000 worth of jewels and securities. The father of their chum, Perry "Slim" Robinson is arrested and jailed as the prime suspect. Henry Robinson is the grounds caretaker of the Tower Mansion and as such, was privileged to live on the premises with his family. There is a heart wrenching scene shortly after Mr. Robinson's arrest, as the Hardy's accompany Slim to tell his mother and younger twin sisters Tessie and Paula, the devastating news. It was taken hard by all involved and as Frank and Joe withdrew from this tear jerking scene, they silently vowed to right this obvious wrong! And they are not too proud to ask for their father's help. In fact, chapter 12 of the OT is devoted solely to Fenton's investigatory efforts in New York City. In the RT, he sends plane tickets for his sons to join him there. Meanwhile, Mr. Robinson has been released due to lack of evidence but remains under a cloud of suspicion. He was let go by the Applegate's due to this and thus, the entire Robinson family was forced to move to a disreputable, poorer section of Bayport, on its outskirts. This is true in both the OT and RT versions but I guess these outskirts are in another section than where the Morton farm and other semi-rural areas are (also on the outskirts). I am disturbed that an area I will describe (page 111 of OT), exists in Bayport. The ideal is shattered! "There were squalid shacks and tumbledown houses on either side of the narrow streets, and ragged children were playing in the roadway." Curiously, Slim describes this area as "just outside the city" (page 80). It's one or the other, just outside or in the outskirts. We can take our choice and I'll go with "just outside" so as to retain my fond memories of Bayport. In the RT (pages 68, 94 & 95), the samething occurrs. Page 68 states that the Robinson's have moved "just outside the city" while page 94 relates how Frank and Callie are taking a bus "bound for the section of the city the Robinsons lived." The description on page 95 almost mirrors that of the OT. Callie is so moved by the circumstances surrounding the misfortune of the Robinson's that she flat out challenges Frank to do something about it, looking him straight in the eyes (page 115). I believe she is not above utilizing her femenine wiles as well. This scene was cut from the RT. Finally, the trio of Hardy's come up with a prime suspect, Red Jackley who is seriously injured in an automobile crash and confesses to Fenton on his deathbed, which in both versions, the Hardy's prevent Officer (or Detective) Smuff from beating their father to the punch. The difference is in the mode. The RT utilized a fire at Rocco's Fruit Stand to delay Smuff while the Hardy's and chums utilize the same locale but with a possible bomb as the bait. Even the menacing "Black Hand Society" of the Italians is mentioned page 132 OT). Surely this is an aside to the alleged Mafia. Armed with Red Jackley's confession (he was also the speed demon), the three Hardy's search both the old and new towers of the Applegate Mansion, to no avail. The grounds themselves are dug up as well, in the RT only. Again, with no results (aside from finding a stash of Mr. Robinson's European flower bulbs), except that of the derision of locals who delighted in seeing the mighty Fenton Hardy fail. And to top things off Henry Robinson is arrested yet again and charged with being an accomplice of Red Jackley's! At one point Hurd and Adelia Applegate themselves are thought of as possible subjects but only in the RT. So, aside from many deletions, there have been an occassional addition or two. Both versions feature Adelia searching the grounds from the new tower with a high powered light and in the RT, the Hardy's are caught red-handed due to this, by Hurd and his guard dog (upon being alerted by his sister). Never admitting defeat but temporarily stymied none the less, Joe and Frank decide on a motorcycle romp through the countryside, to hopefully clear their minds of the ragged wisps of defeat that clogged them. Luckily for them, the two sleuths choose a route that takes them to the vicinity of where Jackely once worked with the rail road. The RT actually has a plausible reason for this route taken. There, they discern an old water tower, along with a new one as well. They each are hit with the possabilities at the same time and they rush to the older of the two towers, to verify their astounding new theory. But in the RT, Oscar Smuff intrudes at this point to ffer a deal, by sharing the reward money for the return of the jewels, if they teamed up. Frank and Joe say they will think about it and Smuff finally leaves, allowing Frank and Joe to get on with it. Which they do, with spectacular results. After overcoming the dangers of reaching the inner recesses of the rickity water tower, they discover the jewels. But in the RT, Hobo Jimmy attempts to lock the Hardy Boys in until they starve, so he could then abscond with the jewels. But our intrepid sleuths are far too clever for this and eventually escape, apparently allowing Hobo Jimmy to escape justice. But being on the threshold of victory and vindication overcame such a notion and they quickly made their way home to report their success in discovering "The Tower Treaure," as stated on page 167 of the RT. The last two chapters of the OT and the last of the RT, reveal the final victory of the Hardy's and Robinson's in an almost Perry Mason type manner. All major participants gather at the tower, for a variety of reasons. Mrs. Hardy is present in the OT but not the RT. Collig and Smuff are kept in the dark about the real reason for the gathering but the Chief is forewarned in the RT, freeing Henry before bringing him to the Applegate Mansion in triumph and not in ignorance. One last difference between the two texts is the reason for Mr. Robinson to have come with the incriminating $900, which Hurd and the police believed was a windfall from the stolen jewels. In the RT, it was Adelia Applegate who loaned Henry the money, swearing him to silence, which he kept. In the OT, the money came from an unnamed friend who was in turn paying off a debt to Robinson, but also owed money to a couple of other men and didn't want them to know of this payback (possibly out of turn). And so the Robinson's are vindicated and move back into the mansion. Perry stays in school while Mrs. Robinson and her twin daighters stop crying, well, tears of grief at any rate. Henry is offered a heart felt apology and a raise. And the Hardy's? They split the thousand dollar reward and on the last page of the RT, plan on building a crime lab in their barn, to co-exist with their gym. No such plans on how they intend to spend their reward is made in the OT. And so the premier case (so-called) of the Hardy Boys is solved and a very satisfactory ending it was, as too was the entire tale, in both original and revised versions. While the OT certainly contained more details than the RT and represented an older era, it is not necessarily a vastly superior book, by any stretch. Harriett S. Adams skillfully reduced the story in page number to meet Grosset & Dunlap's new specification. I say skillfully because I feel the core essence remains untouched and I know how good I felt when I first read the RT back in 1963 or so. Mightily pleased and that was because that "The Tower Treasure" was a darn good book that represented all that I hold dear with the Hardy Boys mysteries: atmosphere, comradery, descriptive countrysides and the willingness to build on the series with each new addition, yet able to be read and enjoyed as stand alones. As to which I now prefer, I must say, neither. They both rank very high in the Hardy canon, in my estimation, and I would urge any potential fans not to miss either! You can still buy either version of The Tower Treasure from Amazon.com! If you are a fellow who thirsts for action and adventure, or you know someone who seeks thrills and mysteries, then you can learn a lot from Joe and Frank Hardy. Why? Because the Hardy Boys know what it's like to be in the heart of the action, and they always manage to find a way out of the stickiest of jams. In The Hardy Boys' Guide To Life you'll find tips from one of the greatest sleuthing teams of all time - on everything from deep-sea diving to dating - to help you navigate through those murky spots in life. Need to know how to cry on the spot? Want a quick lesson in botany? What's the best disguise for a certain situation? Answers to all these questions (and a whole lot more!) are waiting for you with the turn of a page. Joe and Frank Hardy still know how to solve mysteries and live life to the fullest. Join them as they guide you to a swell life filled with sleuthing, skullduggery, and good old-fashioned fun! Similar in content to The Nancy Drew Guide To Life, this book outdoes it both in size and quality. Oddly enough, although this is a picture cover (PC) book, it comes with a dustjacket bearing art identical to the cover! This short (less than 50 pages), inexpensive ($8.95 list price) volume is illustrated with color reproductions of various original series covers and some black and white frontispiece illustrations. Divided into 7 chapters, The Hardy Boys' Guide To Life offers up advice gleaned from the pages of the stories themselves. Chapter One, Better Safe Than Sorry - Survival Tactics quotes The Twisted Claw, informing us "Don't call out when trapped. If you startle the guy, he might react violently, especially if he's some kind of unstable recluse." Sage advice, considering the inordinate amount of unstable recluses Frank and Joe have encountered over their long careers as teenage sleuths! Chapter Two, All In A Sleuth's Day, offers this from The Secret Of The Caves: "Being a detective can be dangerous! Don't take unnecessary risks. Your Enemies are dangerous." Fortunately for fans of the series, Frank and Joe never seem to be able to follow this advice! Chapter Three, Mister Manners, scoured The Mystery Of The Aztec Warrior for "When you solve a mystery, it's nice to throw a party with plenty of good food. ", a sentiment which original series author, Leslie McFarlane, would heartily agree! Chapter Four, Handy Instruments, informs us "If you walk straight into a den a wolves, snap on your flashlight. That might hold them back." (Hunting For Hidden Gold) And, if that doesn't work, try hitting one on the nose with a handy rock! Chapter Five, Helpful Hints For The Out-of-Doors came up with "If you're at sea and a storm is brewing, coves can help to take some of the kick out of the waves." (The Great Airport Mystery) Long-time fans know full well that if anyone should know what to do if a storm blows up while you're in your boat, it must be the Hardy Boys! Chapter Six, Useful Catch Phrases, takes this from The Melted Coins: "Boy, I thought my number was up! ", a phrase which would surely not be out of place in any Hardy Boys story! Chapter Seven, Lessons Learned, instructs "Don't press your luck too far. Nothing good can come from a foolish trip." (The Twisted Claw), advice that seemingly fell on deaf ears as far as the Hardy brothers are concerned. Originally this book was to be titled The Hardy Boys Swell Guide to Life, which is probably why the DJ description still uses the archaic word swell. I enjoyed The Hardy Boys Guide to Life. 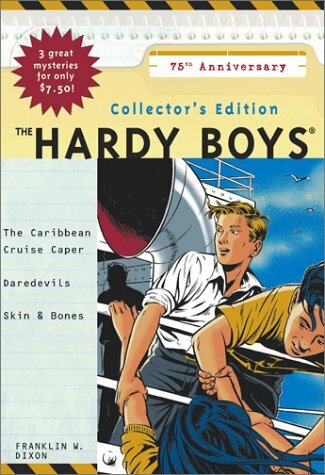 It is a fun, quick read which should be in every Hardy Boys fan's collection. I'm currently reading the last of the John Button ghosted novels in the unrevised original series, The Clue of the Broken Blade. To my surprise, in the necessary recap of the previous plots of the Tower Treasure, and the last novel, the Mystery of the Flying Express, Laura Hardy is referred to, in name, as Laura Mildred Hardy! It's interesting to wonder if someone had caught the mistake in the preceding novel of having had Aunt Gertrude refer to the Boys' mother as "Mildred" and wanted to rectify the situation. Was it Button himself or the writer of the outline? I do not recall Laura's full "middle" name appearing anywhere else in the series. 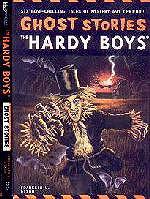 I've spent the summer reading, from the beginning with v.1, the revised Hardy Boy editions. Most have been at least average. However, having gotten to the revised Mystery of the Flying Express, and finding out that the train of the title in the unrevised edition had been replaced by a hydrofoil boat in the new edition, I decided to reach for an original, unrevised story that I did not remember reading in the early 60's. (I was caught right in between the wrap spines-PC changeover and the beginning of the revised stories. The Hidden Harbor Mystery was revised by the time I read it in '62. I'm looking forward to the Applewood reprint to read the original) The Clue of the Broken Blade has turned out to be a quite an exciting read, not only for the Laura/Mildred discovery, but for the engrossing story. Not only are there a number of extraneous details and/or small plots introduced without immediate resolution (as seems to be the norm in Button's novelizations) but the story contains a rather sympathetic treatment of metal illness. The plot is more complex than it seems in having a rather narrow geographic area for a setting (small towns around Bayport) and stolen sabres for a theme. The action is lively and never seems to flag. I have not finished it yet (I really don't want it to end) but it's one of the better titles, both revised and unrevised, I've ready lately. 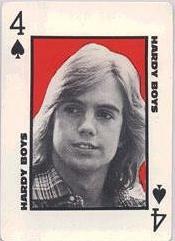 Share Your Thoughts About The Hardy Boys With Other Fans!